Parc Venton Sah is a detached character cottage set in a rural location, close to Mullion village with private access, parking and central heating. Walking distance to Polurrian Cove and Mullion Cove. 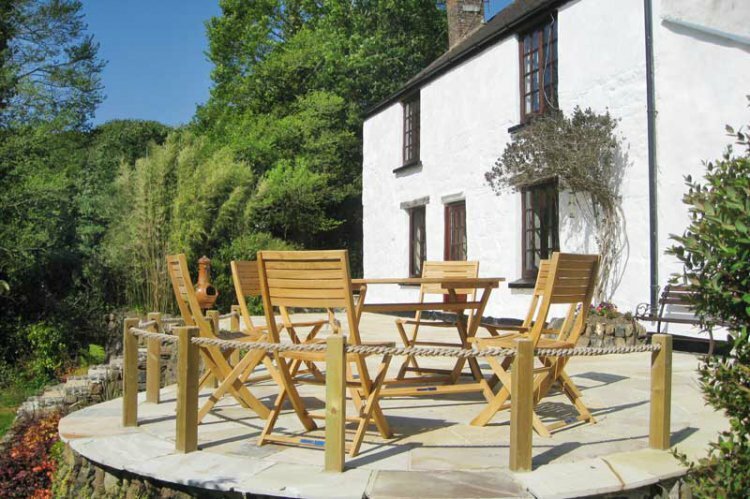 Terraced gardens with stream, and garden furniture. This property is entered via a small lobby and two steps down to the kitchen and cloakroom, one step upto the utility. The kitchen is equipped with built-in double oven, induction hob, under counter fridge, slim-line dishwasher and microwave. A fridge/freezer, belfast sink, washing machine and tumble dryer are located in the utility with the boiler. An 'L' shaped dining room with beamed ceiling and a large inglenook fireplace with a wood burning stove, dining table, chairs, two seater settee and hi-fi, this room has views over the private gardens. Through into the Lounge with a large open fireplace and another wood burner, comfortable seating for six, TV, Freesat, DVD player, beamed ceiling and a window seat with views over the garden. Books, DVD's and a few board games are there for your use. There is access to the patio, gardens and stream via the front door. Upstairs there are three bedrooms. Main bedroom with 4' 6" double bed, large wardrobe, chest of drawers, TV, Freesat & DVD player, window seat with views down over the garden. The second double bedroom with 4' 6" bed, wardrobe, chest of drawers, shelving and again with views over the garden. Bedroom three with twin 3' single beds, bedside tables and shelving with more books for you to choose from. The bathroom has a free-standing bath, toilet, handbasin and large walk-in shower. Electricity, bedlinen,towels, central heating and logs are all included in the rental. Please note: There is a stream running through the bottom of the garden, small children should be watched carefully. This property accepts one dog by prior arrangement. No smoking requested inside this property please. The property now has Wifi available.